Can a simplified weather station solution still provide you with good measurements? 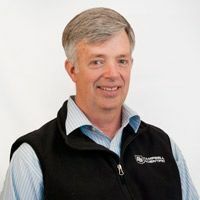 In this interview, Alan Hinckley, Senior Application Scientist-Meteorologist, shares his excitement for the ClimaVUE™50 and how users of various backgrounds can benefit from its simplicity in capturing quality weather data. Alan was interviewed by Robin Deissinger, the blog editor. The ClimaVUE 50 is a small, easy-to-install, all-in-one weather sensor. It combines the six most common met sensors into one. It measures wind, temperature, RH, barometric pressure, solar radiation, and rain—without any moving parts. The ClimaVUE 50 communicates using a simple three-wire SDI-12 protocol. Why are we offering this all-in-one sensor? There’s been customer demand for a simplified weather station solution that provides good measurements. For example, an environmental monitoring network needs to cover an area with many stations. A less expensive station based on the ClimaVUE 50 could fill in the gaps between the more expensive reference stations built using individual sensors. Another example of a good fit for the ClimaVUE 50 is the environmental researcher whose focus is on something other than weather, such as butterflies. This researcher may need supplemental environmental data to help explain some behavior, such as monarch butterfly migration. How easy is it to install the ClimaVUE™50? First, install a rigid pole with a diameter of two inches (five centimeters) or slightly smaller to the desired height—often two or three meters. Then, mount and level the ClimaVUE 50 to the pole using a half-inch wrench. Next, install a small enclosure containing the data logger and battery. Finally, check the readings, and you're done. What are some pros and cons of the ClimaVUE™50? One of the great things about the ClimaVUE 50 is that there are a lot of good-quality sensors in this small package. And these aren’t low-end sensors. These are digital, solid-state sensors that can be trusted to provide measurements that will meet many environmental monitoring requirements. While they aren’t the best possible sensors—in the good, better, best continuum—I think they fall into the better category. Another important benefit of this all-in-one sensor is its very low current use. On average, it draws less than one milliamp at 12 Vdc. This means that, in a typical application, you just need eight alkaline D cell batteries to power the sensor and data logger for three to six months. If you add other sensors or telemetry devices, our Power Budget Spreadsheet can help you estimate your power needs and select an appropriately sized battery and solar panel. To achieve its low current, the ClimaVUE 50 measures its wind, temperature, solar radiation, and rain sensors every 10 seconds. The barometric pressure and RH are measured every minute. Consequently, if you have an application that requires measurements faster than every 10 seconds, the ClimaVUE 50 may not be the most suitable option. 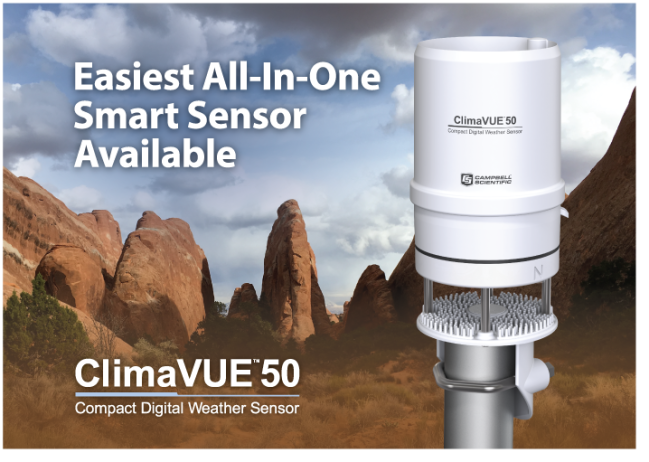 The ClimaVUE 50 is primarily a growing season all-in-one sensor. It’s true that the ClimaVUE 50 can survive the snow and cold found in high latitudes and altitudes. However, it is not equipped with heaters. So, snow and ice buildup will likely compromise your measurements in wintry weather. Another limitation of the ClimaVUE 50 is that all the sensors are positioned at the same height. This means, for example, that you can’t mount the rain gage close to the ground, the temperature sensor at a height of two meters, and the wind sensor at a three-meter height. How does the price of this all-in-one sensor compare with purchasing the sensors individually? The ClimaVUE 50 is a great value for the parameters commonly measured on weather stations. The price is approximately $1,000 (that's U.S. dollars) less than buying equivalent individual sensors. Is the ClimaVUE™50 available now? Yes. We recently released this sensor, and you can order the ClimaVUE 50 now. After reading this introduction to the ClimaVUE™50, do you want to learn more? Please visit the ClimaVUE™50 web page. To ask Alan a question about the ClimaVUE™50, post a comment below. This seems like a very interesting all-in-one solution. Has it been tested under arctic conditions? The ClimaVUE50 was installed at several sites in Montana which sometimes experiences near arctic conditions. Installed to monitor the weather during the growing season, they were left running and survived the winter conditions. The sensor does not have heaters so most of the measurements are likely to be compromised from time to time by the snow and cold.